Review: It is the year 2027 in England, the world is chaotic and women have become somehow infertile. An iron-handed warden is brought in to institute marital law. His job is threatened when a woman finds that she is pregnant. It would be the first child born in 27 years. A fantastic piece of drama film making. Based on a novel by P.D. James, who was reportedly very pleased with the finished film. The director slightly changed things in this from the novel it is based on. The cinematography is brilliant. A very interesting film. Very dark and grim. Michael Caine based his performance on John Lennon. I was very impressed with his little cameo in this. At one point in the film you can see The Shard in London. This has digitally been put in as The Shard had not even started construction. The construction was started in 2009, three years before the movie was filmed. 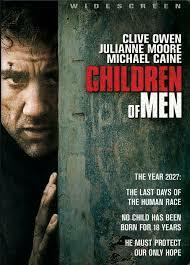 In 2006 both Clive Owen and Chiwetel Ejiofor starred in Inside Man together. If you look closely in this film you will find references to the Christian Bible. The main message in this is hope but not necessarily in a good light-hearted way. At the Bafta Awards in 2007 this won two awards and they were for Best Cinematography and Best Production Design.